This was my first time trying the Spartan Sprint, and only my 2nd contest experience of any kind (barring Field Day). I heard a few sprinters right at the beginning of the sprint, and then nothing for the following hour or so. Bands were noisy, with a lot of storm activity around my QTH. Still, it was a fun exercise, and very good practice listening to weak CW signals and faster code than I'm comfortable with. K2 and Flex-1500 to attic dipole on 40 Meters. I thought nobody was playing until I heard K4BAI and N4BP working station after station. Hmm, ... what do they have that I don't have - other than just antennas and skill? Many thanks to those who kindly pulled me out of the noise as I experimented between my early K2 and the new Flex. Hope to "hear" you all next month. Got in late, thought the bands were shot but Finally got a few. Tnx to John, K4BNI, for contacts on 40 and 80. Gonna try next month. Thanks to K4BAI and N4BP for the 40 meter Qs. Hope November is no turkey. On 20 meters I found WD9F/KH6, Woody, also QRP at 02:14Z. I continued tuning and calling on 20 until 02:35Z, without success, at which time I moved to 40m. No success on 40. At 02:50Z I moved to 80m, hoping I might find someone to work there, but no joy. So QRP it's been a rather disappointing evening. Hopefully next month will be a little better. Rig was the usual K2 at 5w to 100' wire. Condx did not seem to be good. I never heard K4BAI on 40 where he is usually strong, did work him on 80. Someone called one of the WI stations on my calling freq and I could not hear the WI station at all. They are usually good copy down here. It was a tough night. Did garner 24 Qs, 17 SPCs. Qs were 4/16/4 and SPCs were 3/12/2 on 20/40/80. Would have been better with better condx and more activity but it was fun anyway. Thanks to all who stopped by and see everyone next month. Major thunderstorm moved over us at the start. Managed 9 QSOs on 20M before rain static took over the band at S9++. 40M not much better with lightning static, but managed 16 QSOs there before determining that, for safety, it was time to disconnect the antenna. Put in 45 minutes then went to watch TV, but the rain was so heavy my DirecTV receiver couldn't get a satellite signal. FT1000MP, 5W output, TH6DXX, dipole, inverted V. 20M was long and I fumbled the start. Only one good QSO there after I remembered to reduce power to 5W. 40 was the main band tonight with a relatively short skip zone and QSOs out to NY, MN, NV, CA, and WA. Heard N9BT working somebody else, but never could find him for a QSO. 80M was pretty good toward the end with QSOs to NY and TX. We need more activity in these Spartan Sprints. And more stations who stick it out until the end to maximize possible QSOs. Thanks for all QSOs. Thanks to John, K4BAI, for my only contact. Didn’t hear anyone else. Conditions, conditions, conditions. I didn't hear the usual stations on 20. Only a few very weak ones. Struggled to make a few Q's before going to 40. Slow going with heavy QSB and everyone really weak. The backup rig - my HEAVY ATS-3 continues to perform quite well with three LiPo batteries, providing 5W out and a final total of 14 QSOs. Conditions were good on 20M, but then deteriorated after the first 30 minutes and only three contacts. I moved to 40M and worked eight more. I was using my backyard vertical. The vast majority of my contacts were on 40M this month, and the noise level was light to moderate. I finished up on 80M with three more contacts. I used this rig recently for a QRP event and did not have the batteries fully charged, but they did well as long I avoided calling CQ. I missed the September Sprint due to an Alaskan cruise. I was working QRP from the ship, but only via satellite on my HT. K1 running 5W to a mini-beam at 25ft for 20m, an inverted vee at 40ft for 40m, and a ground mounted, near bottom-loaded vertical for 80m. 20 seemed to be in rough shape - made 1 Q there with N4BP - heard others but they were way down. Switched to 40 and made a few, including N4BP. Switched back to 20 and heard K7TQ loud for a CQ - I called but he was gone. Switched back to 40 and worked K7TQ straight away...cool. Made two Q's on 80 - one with KB3TEL (QRO) in PA and another with K4BAI in GA to complete a two-bander with John on 40 and 80 - that may be my first 80m GA QSO since QRV from Albany...double cool. Thanks to all of the participants and thanks to the organizers. K3/10 @ 5W and various wire antennas. My ears were still ringing from the Texas QSO Party, but I had a new 40 antenna to try. 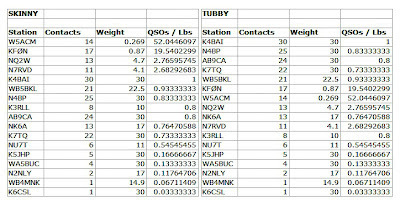 QSOs on 15, 20, 40 and 80M were 1, 4, 12 and 4. N7RVD was strong on 15 - wish I had heard others. Strongest signal heard was AB9CA. No 3-band QSOs, sadly. 40M inverted-V worked well. Had fun. Participation seemed to be down this month but a fun contest never the less. The rig was an ATS-3B powered by a stack of NiMh AA cells. 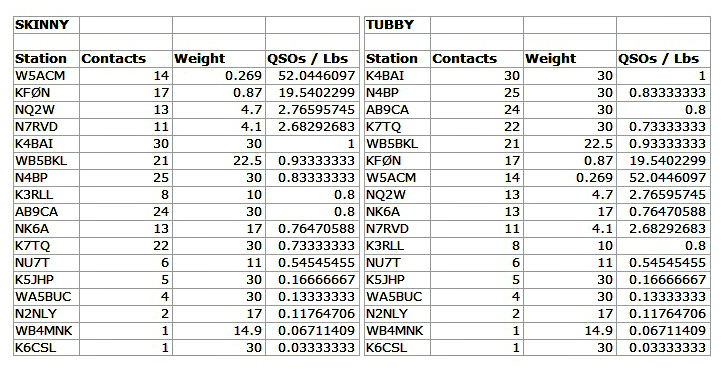 I heard only one station on 20 meters, Randy, K7TQ ,so 40 meters was the most productive band for me. Unfortunately, a rather high planetary A-index of 31 made signals weaker than normal. Many simply could not copy me and vice-versa. 80 meters was a wash here with no signals heard. Best DX was Washington, N7RKD, and one California station, KO6Z who was running only 2-watts! The jammer on 7040 kHz didn't seem to bother too much here since I am inside of his skip zone at that time of the evening. Thanks to all who made the evening an enjoyable one! Where else could you have this much fun with a diminutive little rig and a stack of AA cells? I could only operate for the 1st hour. There were a good number of stations on 20m, but it seemed like a lot more than I could work. As 20 m has been for the last several months, about 20 minutes was all it was good for. On 40 m I worked the usual suspects. I hope that in Nov. I can do both hours.